It’s easy saying yes to things that you want to do or enjoy, but what about the things you never considered doing, or even thought about. During almost 2 years of travels there have been numerous occasions when an ‘opportunity’ would present itself and both Donna and myself would find ourself saying yes, despite initially thinking ‘NO!’. In most, if not all instances, we found the experiencies to be positive ones. Posing for a picture with my Beano class. When we were first planning to head off on the big around the world trip, the world economy was taking a bit of a beating and we both knew that finding work would be vital at some point to sustain our travels. The initial plan was to work in Australia, but we had been hearing rumours that finding work was not as easy as it used to be. 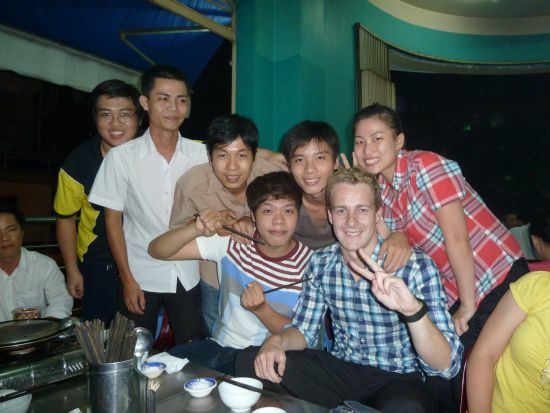 Having visited a travel fair, Donna came up with the idea of teaching English in Southeast Asia. My initial thought was no way, but the more I thought, the more I grew to like the idea. After some further discussion, we both threw ourselves into a 120 hour TEFL course. Kids from my Beano class carrying out an activity. Fast forward several months and we were on our travels through Southeast Asia and loving every minute of it. 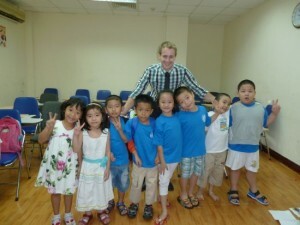 As we were travelling, the thought was always in the back of our mind about finding a potential place to teach English. We had always been vaguely thinking Cambodia, but upon landing in Vietnam, we both knew almost immediately that Vietnam was the place where we would teach and Ho Chi Minh City (aka Saigon) was where we would become teachers. I found myself teaching students of all ages and levels. On the weekends I was responsible for teaching groups of up to 25 kids aged between 4 and 14. Keeping kids at this ages focused is no easy task. During the week was mainly teenagers and adults, which proved a little easier. It was also rewarding teaching the lower levels because you could really see a steady improvement in their English skills. 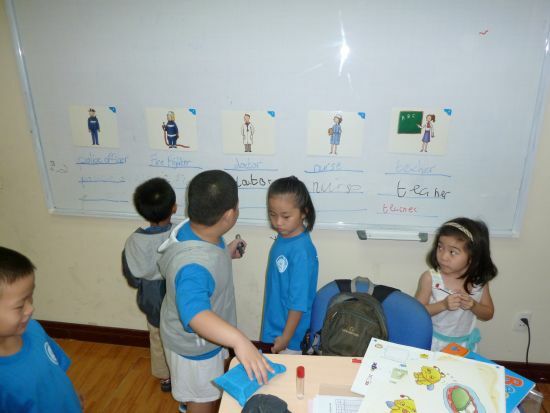 At the start of the course, they could understand and speak little or no English but by the end of their course they were able to understand and speak basic sentence structures and questions. Not only did I find myself in the classroom but I was also asked to do story-telling at the local book-store. I never thought that I would ever be in a book store reading stories such as the Three Billy-Goats Gruff, The Hare and the Tortoise and the Three little pigs. For a county boy like myself, choosing a city with a population of almost 10 million people to live and work could have been a disaster, especially considering the entire population of Northern Ireland is a little over 1.7 million. After a bit of a shaky start initially, I began to fall in love with the place, which might explain why we have since been back to Saigon to teach English again. You can read more about living and working in Vietnam in my blog post Working in Saigon – A day in the life. Yiu write so beautifully, have you been published?